Ukraine could rightly be considered as agricultural country. According to estimations of international experts Ukraine is among TOP-3 European agricultural countries with the share of agriculture in GDP at 17-18% in 2017. Upon that production of grain and oilseed crops was instrumental in reaching this level. Thus, according to FAO, Ukraine ranked 8th in global grain production and 7th in oilseed output in 2016. Herewith, the high-quality crop depends not only on modern technologies and climate but also on lean approach to formation of variety structure. According to the study “Market of crop protection products and seeds in Ukraine” made by APK-Inform in 2016-2017, the qualified producers solely planted about 14 mln ha with grain and oilseed crops and they used 1.5-1.7 mln tonnes of seeds. Winter wheat seeds made up 2/3 of total seeds volume. Below we examine the Ukrainian seeds market in view of TOP-5 crops. Wheat is one of the main crops cultivated in Ukraine. According to official data, commercial wheat area solely reached 4.9 mln ha in 2017 with winter wheat accounted for more than 90% of total area. According to the study, variety preferences mainly depend on farm planted area. Thus, during planting campaign of 2016/17 season the farms with area less than 5 thsd ha mainly preferred 5 winter wheat varieties – Shestopalovka, Podolyanka, Bogdana, Smuglyanka and Antonivka. The area under these varieties reached about 26% out of total at farms with mentioned area. Upon that the area under Shestopalovka and Antonivka varieties increased significantly while that of Podolyanka and Smuglyanka declined somehow. At the same time, the preferences of middle-size farms (5 to 10 thsd ha) were stable. Over the last years they used Bogdana, Shestopalovka, Smuglyanka, Kuyalnik and Podolyanka varieties. However, despite the area size, variety preferences were rather intent at these farms and TOP-5 varieties accounted for 25% of total seeds used. The preferences of the farms with area higher than 10 thsd ha differed significantly. The study revealed that they mainly used Antonivka, Smuglyanka, Bogdana, Skagen and Podolyanka varieties. 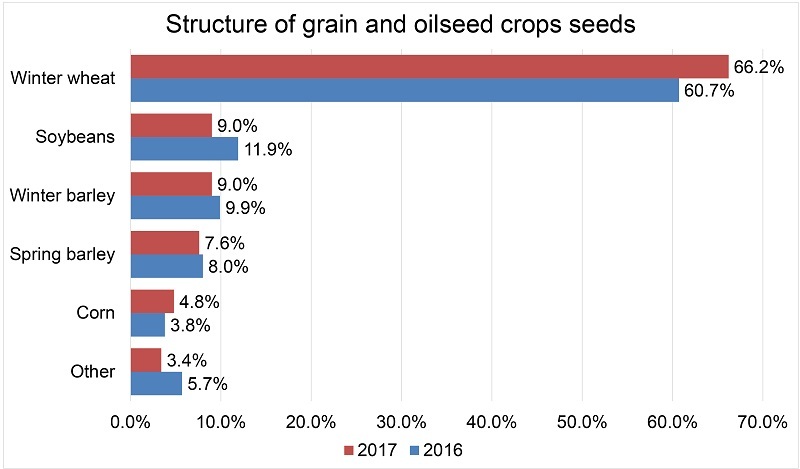 Moreover, taking to account that broadly farmers preferred to use their own seeds, the variety range was stable year on year, except Podolyanka. The sowing of this variety has been declining in all types of farms. Moreover, farmers consider not only variety qualitative characteristics but also a climate zone while planning the variety structure. For example, Shestopalovka, Antonivka, Kuyalnik, Mission Odessa, Odesskaya 267 and Blagodarka varieties are widely cultivated in southern regions, while Bogdana, Podolyanka and Favoritka varieties are mainly used in eastern part of the country. Soybeans have the biggest area among spring grain and oilseed crops after sunflower and corn. Upon that it accounted for 9% of total seeds volume (2nd place in the rating). According to official data, commercial soybean area solely reached 1.8 mln ha in 2017 and the total area reached 2 mln ha. Farmers are rather interested in soybeans production. Thus, they are willing to get high yield and they plan the variety structure with greater deliberation year by year. According to APK-Inform, Ukrainian farmers cultivated about 230 soybeans varieties during two last seasons. At the same time, variety preferences differed significantly depending on farm size. Madison variety was an exception that was the most used one at all farms. The highest difference in varieties between two seasons was observed at the largest farms. Madison, Annushka, Terek, Lybid and Anastasiya varieties accounted for 40% out of total seeds used in farms with area less than 5 thsd ha. Unlike bigger farms, variety structure in this segment was mainly stable as farmers basically used their own seeds. At the same time, middle-size farms preferred Madison, Valuta, Terek, Horol and Almaz varieties in 2017. 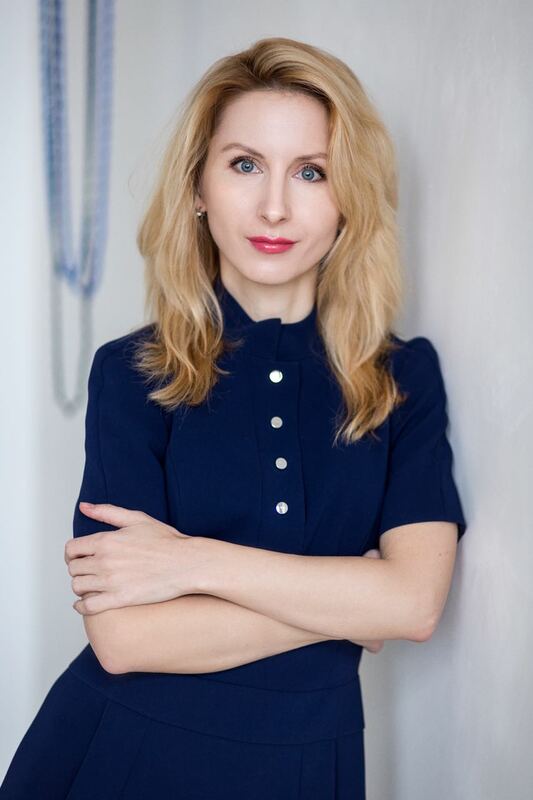 For Valuta it was a real breakthrough as it took the 25th place in the list in 2016 with the share at 1.7% and it ranked the 2nd in 2017 after leading Madison. 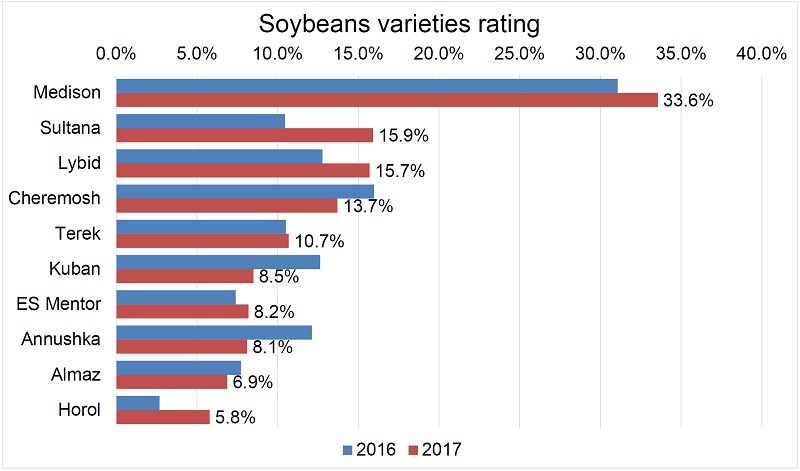 The list of soybean varieties cultivated at large farms stayed the same in 2017. 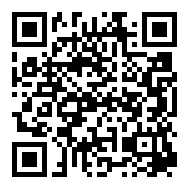 However, varieties shares changed. Cheremosh gave ground significantly as it ranked the 2nd in 2016 with the share at 12.3% and moved to the 4th place (8% share) in 2017. According to official data, Ukraine planted barley throughout 1.3 mln ha in 2017, winter barley accounted for almost 50% out of total area. Winter barley area declined by 17% in 2017 due to unfavorable weather during planting campaign. Currently there are more than 60 varieties of winter barley on Ukrainian market. At the same time, registered varieties accounted for 60% in variety structure formed by farmers. Analysis revealed that except qualitative characteristics farm size influenced seeds preferences. 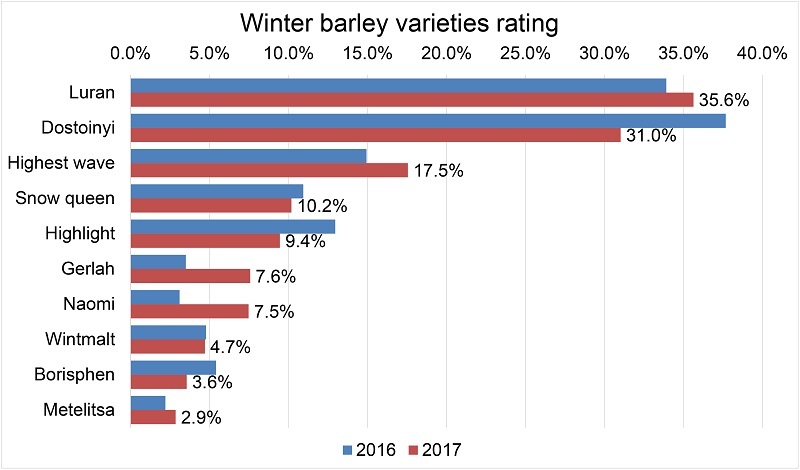 Small-size farms mainly preferred five winter barley varieties including Dostoinyi, Luran, Highest wave, Snow queen and Highlight. At the same time, middle-size farms preferences differed somehow and they mainly cultivated Luran, Dostoinyi, Highest wave, Gerlach and Academicheskiy varieties. Notably, the 25% of respondents at each segment chose Luran variety. The most significantly variety structure differed at large farms with area higher than 10 thsd ha. Thus, the study revealed that TOP-5 varieties accounted for 75% out of total seeds volume in 2017. These farms preferred Highlight, Naomi, Luran, Gerlach and Dostoinyi varieties. Moreover, it was the large farms who often revised the variety structure. For example, Wintmalt ranked the 2nd during planting campaign of 2015/16 MY and it moved to the 6th place next year. Variety structure of spring barley is more diverse comparing to winter barley. The study revealed that Ukrainian farmers cultivated 92 varieties of spring barley during 2016-2017. TOP-10 varieties accounted for 70% out of total seeds volume. 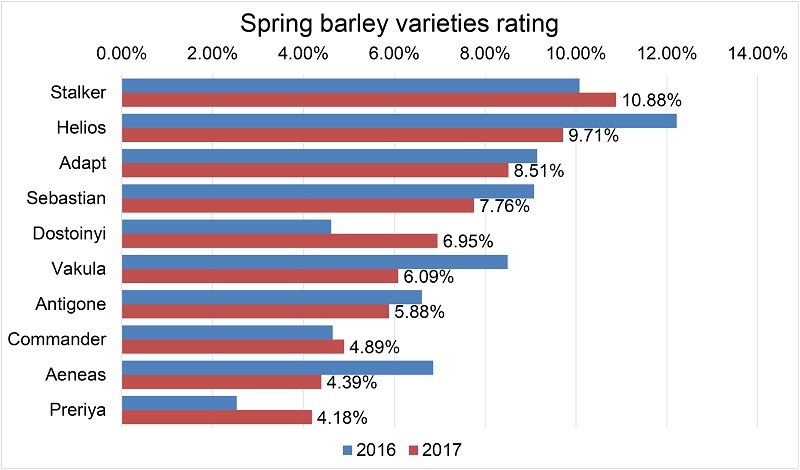 The variety structure of spring barley was the most diverse at large farms (more than 10 thsd ha) the same as in case of winter barley. At small-size farms TOP-5 varieties accounted for 45% out of total seeds volume in 2017, down from 55% in 2016. 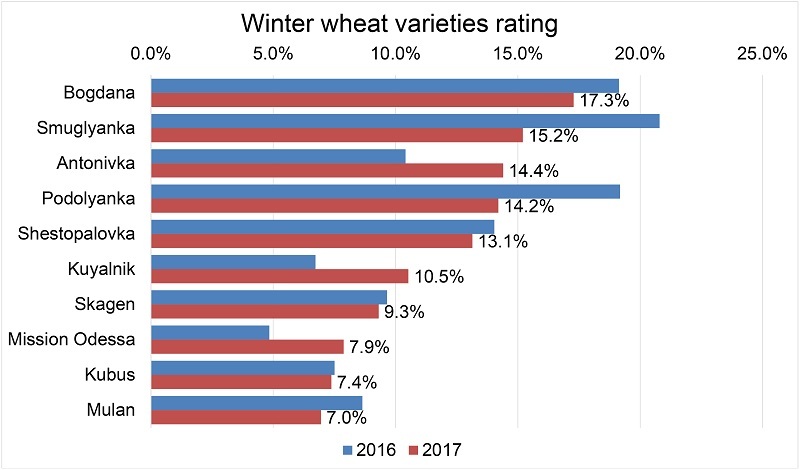 At the same time, the list of cultivated varieties stayed stable and farmers preferred Stalker, Adapt, Helios, Dostoinyi and Aeneas over the last two seasons. The three leading varieties were the same at middle-size farms. According to APK-Inform, Helios, Adapt and Stalker varieties accounted for 40% out of total seeds volume in 2017. TOP-5 varieties covered about 2/3 of total seeds used at large farms. Farmers’ preferences were less intent in 2017. 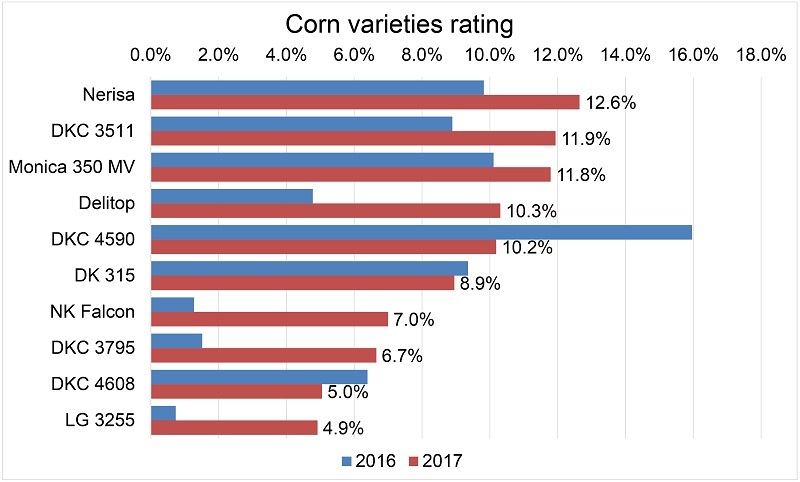 Thus, the same varieties were in TOP-5 in 2016 with the common share exceeded 80%. Moreover, the variety structure of large farms differed significantly from that of small and middle-size farms. They preferred Antigone, Sebastian and Vakula that were barely used in smaller farms. Corn takes the 5th place in the rating of seeds used. It is one of the main grain crops in Ukraine. At the same time, it is very important to consider the variety structure particularly amid climatic changes observed over the last couple of years. Farmers have to revise the variety structure more often preferring disease resistant hybrids. The table above shows that the large farms had more intent variety preferences. Thus, at small farms TOP-5 varieties accounted for just 16% out of total seeds volume, while this index reached 22% at large farms. Actually, all farm types cultivated DKC 4590 and DKC 3511 varieties. Small-size farms preferred Monica 350 MV, DKC 4590, DK 315, DKC 3511, DKC 4964 varieties. Middle-size farms cultivated Monica 350 MV, Nerisa, Delitop, DKC 3511 and DKC 4590. However, DKC 4590 gave ground significantly at this segment as it was the leading variety in 2016. The variety structure changed somehow at large farms. Farmers preferred to cultivate DKC 4590, DKC 4408, Nerisa, DKC 3511 and DK 315 in 2016. The TOP-5 list changed in 2017 and they turned to Nerisa, DKC 3511, Delitop, DKC 4590 and NK Falcon. Summarizing all the above we should point out that the right choice of seeds is the key to high-quality product regardless of crop. Timely revision of variety structure let farmers to keep the average yield high. 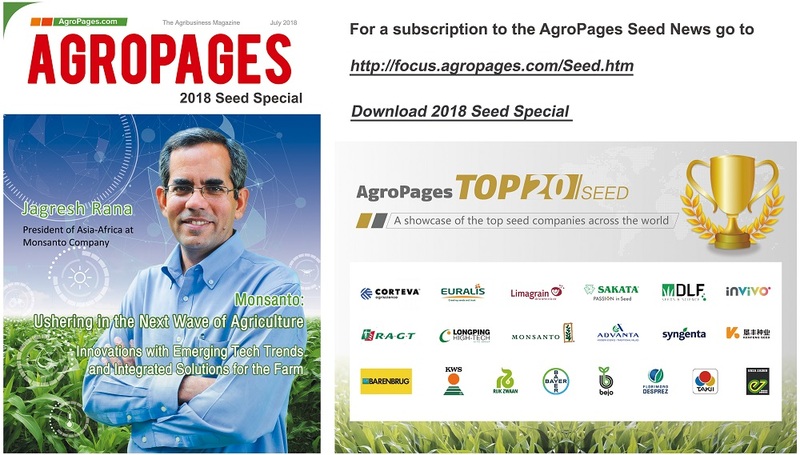 Please download AgroPages' latest magazine - 2018 Seed Special to see more.